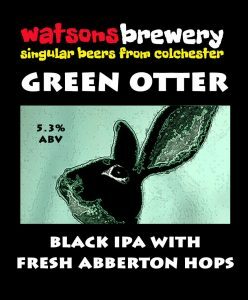 I was due to brew semi-regular beer Black Otter BIPA, but had a last-minute offer of some green hops from a garden near Abberton Reservoir. So the Amarillo and Citra went back into the freezer and a whole heap of fresh hops went from garden to boil kettle in a matter of a couple of hours. Just a single cask and bottles. More laters.